Hi friends! We just got back from a holiday weekend in Nacogdoches celebrating all of their Christmas adventures. Can you believe we are just weeks away from that jolly old St. Nicholas making his appearance!!! Triston has already started counting down the days until the big day. For those of you who know me, you know I’m typically at Walmart at least once a day grabbing last minute dinner options or pull ups for Channing. And speaking of pull ups, in case you were wondering…yes, we are still working on potty training. The struggle is real. This time around hasn’t been as easy as is was with Triston. And I know this is so random, but I actually get my oil changed at Walmart too. Sooooo, you can call it how it is… I basically live there. lol I kid, I kid. I recently started shopping at Walmart’s Lord & Taylor section. I’m not sure if your heard, but Walmart upgraded their fashion line and now carries a ton of on-trend pieces! They have so many flexible mix & match pieces perfect for your holiday party all the way to everyday casual wear. Trust me, I was surprised too! I was SO excited when I saw all the cute holiday pieces. Do yourself a favor and check it out! This whole outfit was part of Walmart’s new fashion line. 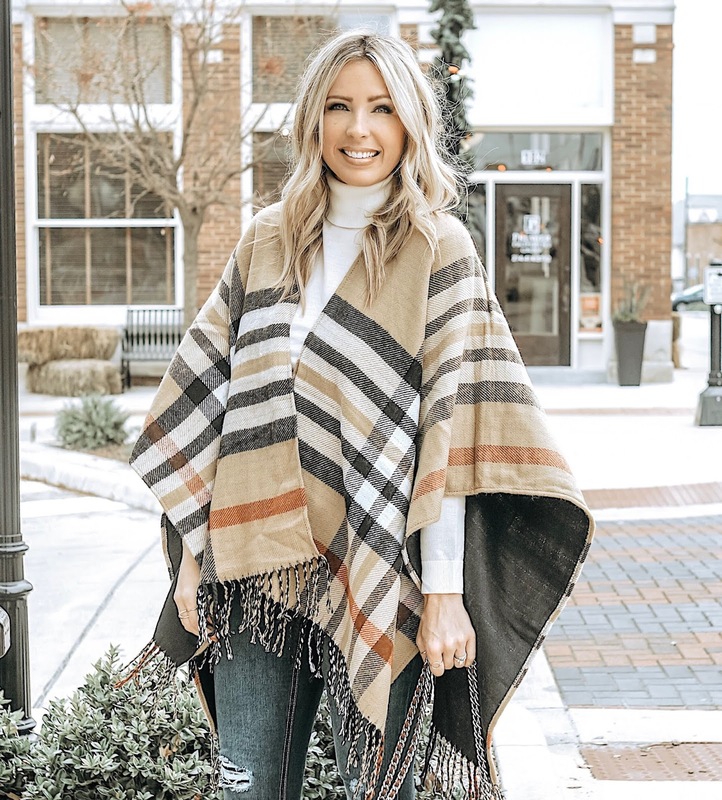 I’ve been obsessing over all of their sweaters, ponchos and even affordable rings! This white cashmere sweater from Lord & Taylor is SO soft and flattering. It’s the perfect flexible piece to dress up or down. Some similar sweater options are here, here (under $25) and here (under $18). My jeans, heels, poncho, X ring & purse are all also from Walmart. 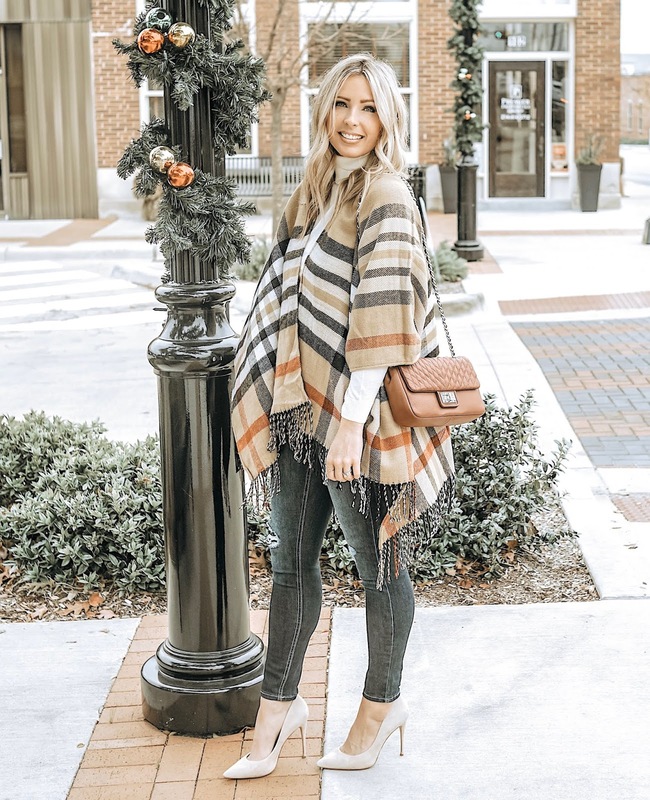 I love a good poncho for fall & winter. These are similar options under $30 here & here. I love a good statement piece that can complete any outfit for these colder months. This poncho is actually reversible…soooooo, basically it’s a buy one, get one free poncho! Talk about rolling back prices. lol The reversible side is all black. Below you can find some of my fave pieces I found at Walmart. And I have to mention that Walmart offers 2-day shipping & free shipping over $35. I had quite a few request for a gift guide for your MIL & Mom, so below is some options I found for HER at Walmart. Also, these are my fave stocking stuffers for HER. Thank you Walmart for sponsoring this post. As always, all thought and opinions are of my own. Your welcome & happy they are helpful. Happy shopping! Lol, right! Their new fashion line is on point. I know, right! They are killin’ it in the fashion game.